Whether it's holiday shopping or searching for a good birthday gift, I'm sympathetic to the shopper who would like to give personal and meaningful gifts but is running up against time. This page offers 20 jewelry items under $30 USD and the price includes free gift wrapping and shipping. Hooray! 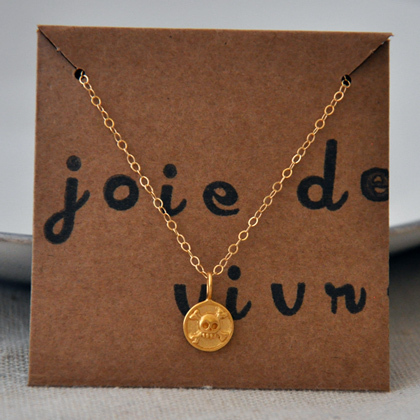 The popular trend of wearing thin, delicate chain paired with small charms or pendants continues, and I've gathered a group of sterling silver and 14kt gold-fill chains with extraordinary pendants. 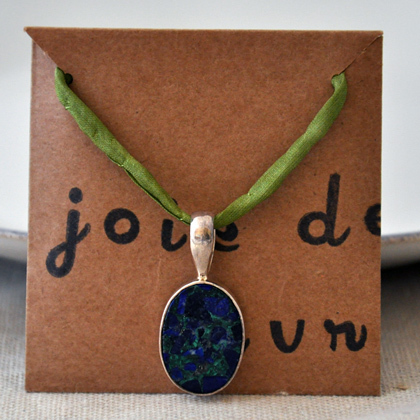 There's also some earrings and pendants paired with soft silk ribbon or cord that can be worn as a necklace or wound around the wrist as an on trend wrap bracelet. Hopefully there's a gift or two that one can use for the next holiday or anyday. 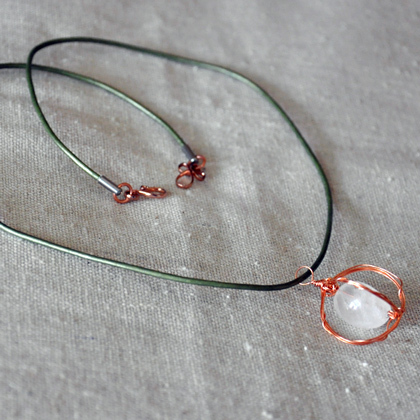 A milky quartz nugget hangs at the center of a copper wire circles in this 18" necklace with metallic leather cord and copper hook and eye clasp. Who couldn't use an astromech droid to make the day go a little easier? This 18" sterling silver ball chain necklace features an orange botswana agate and rainbow moonstone "droid", ready to tackle (or at least share) life's mishaps. Spring ring clasp. For those thinking a darker astromech droid might be just what is needed, there is this gemstone pendant of matte druzy agate and labradorite on an 18" sterling silver square chain with spring ring clasp. 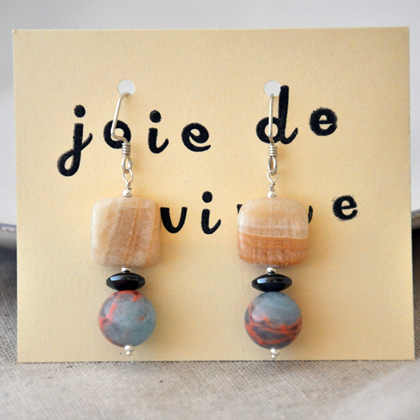 The impression jasper beads in these 2" sterling silver earrings have been dyed a gorgeous powder blue, and these are paired with neutral, warm-hued calcite square beads and hematite for nice contrast. Sterling silver hook earwires. Azurite is a softer gemstone often found in arid copper-bearing areas along with malachite and copper. 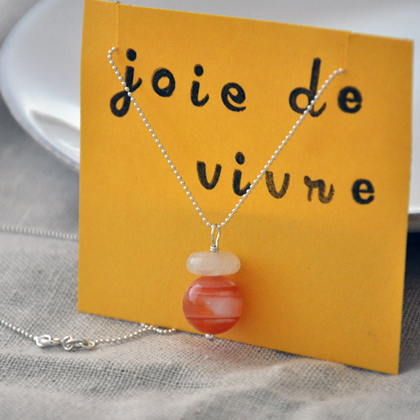 The gemstone is set in sterling silver, and the 1 1/2" pendant is strung from a 40" long 2mm silk cord that can be tied at a variety of lengths or wrapped as a bracelet. 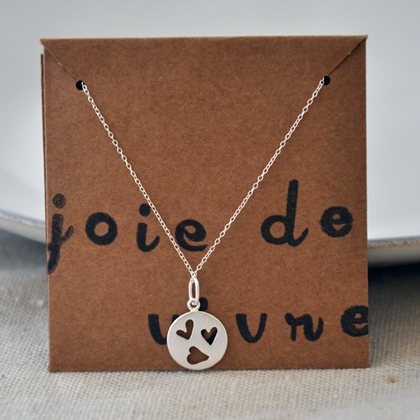 The 1/2" circle pendant is matte finish sterling silver with several heart cutouts paired with an 18" sterling silver 0.6mm chain with spring ring clasp. 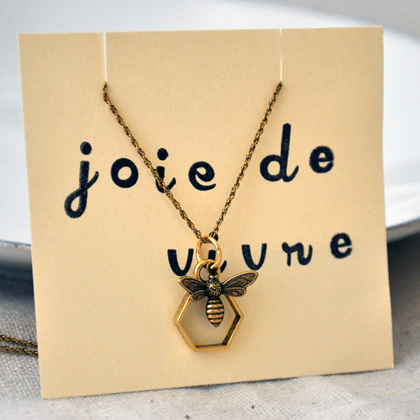 Warm, golden antiqued brass is like honey in homage to the marvelous bee in this 18" brass rope chain necklace with a honeycomb-shaped hexagon home for the vintage style bee charm. Spring ring clasp. 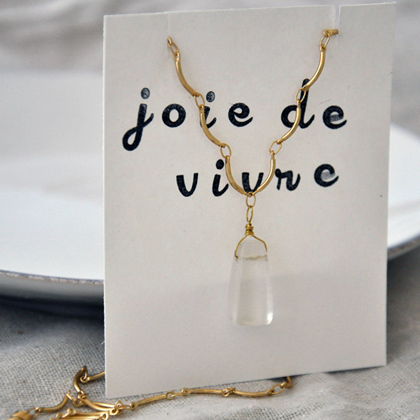 A single snaggletooth shaped glass drop is the feature in this 18" matte gold-plate link necklace with gold-fill magnetic clasp for easy wear. 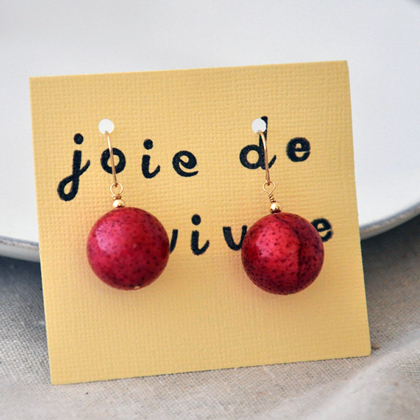 Large dyed red coral beads are the feature of these 1" 14kt gold-fill earrings with hook earwires. 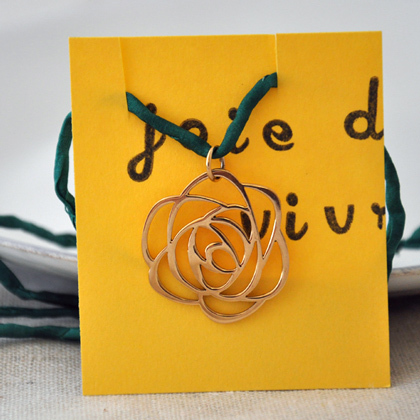 A 1 1/2" bronze rose pendant is the feature of this 40" long 2mm silk cord necklace. The silk can be tied a variety of lengths or wrapped as a bracelet. These 1" earrings with gold-plate spikes and 14kt gold-fill hook earwires are simple, lightweight and delightfully angular. 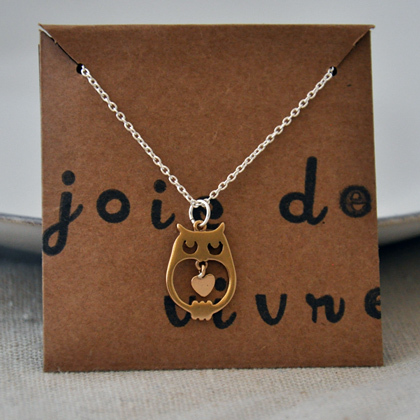 A small 1/2" bronze owl with heart rests on an 16" sterling silver 1mm cable chain with spring ring clasp. 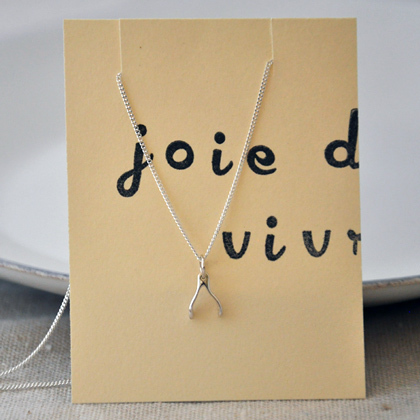 This small 1/4" sterling silver wishbone on a 16" sterling silver curb chain with spring ring clasp could be just the good luck token that a person needs! 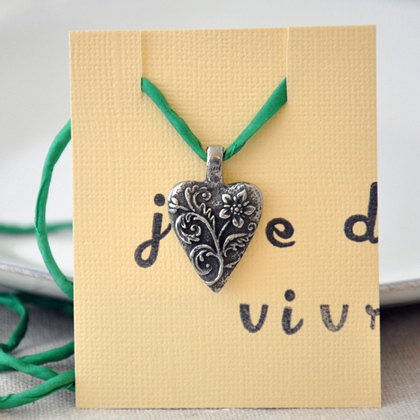 The front side of lead-free pewter heart pendant from Green Girl Studios shows a flower and the back side features a blossom of wisdom: "Some pursue happiness / others create it". 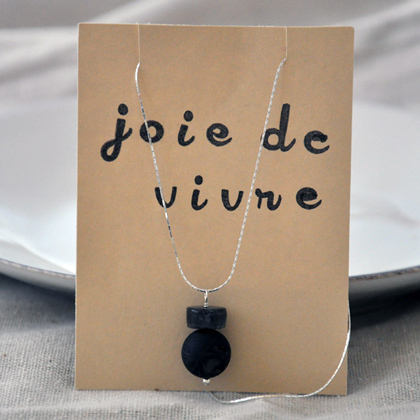 The 1" pendant hangs from a 40" long 2mm silk cord. 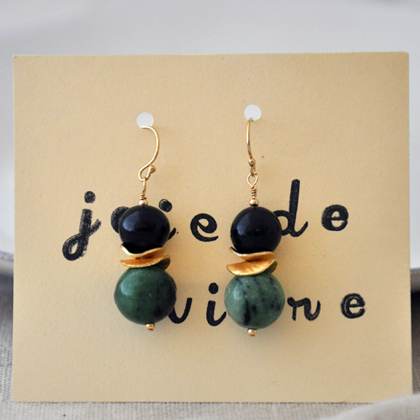 Hypersthene and zoisite beads give these 1 1/2" 14kt gold-fill earrings with hook earwires great color and sheen. 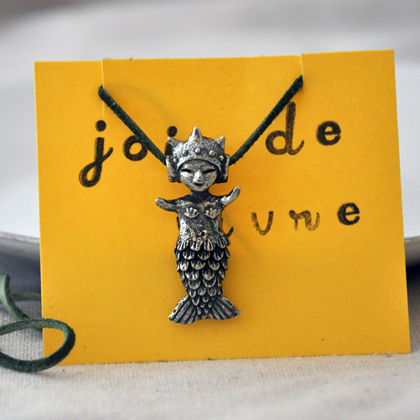 This 1 1/2" mergirl lead-free pewter pendant is another quirky creation from Green Girl Studios. She greets the wearer from a 28" long 1/8" dyed green deerskin leather lace. 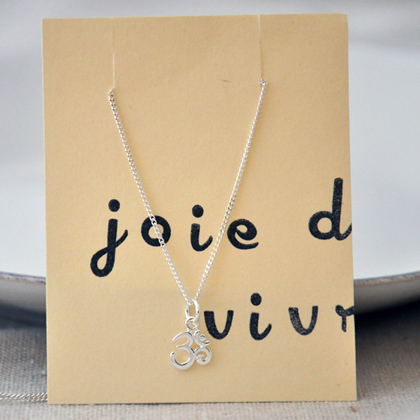 This 16" sterling silver curb chain necklace with spring ring clasp features a sterling silver 1/4" "Om" symbol charm for calm focus and style. 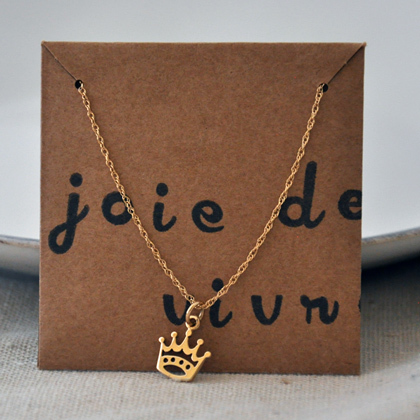 This 16" 14kt gold-fill rope chain necklace with spring ring clasp features a small 3/8" bronze crown for local royalty. Not finding quite what's needed? Interested in more selections? 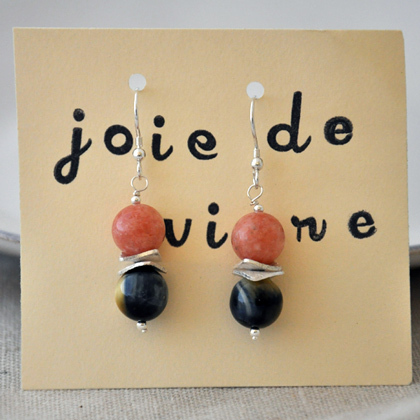 Try the sub sixty page for more gemstone pendants and other gift ideas under $60 USD.